A meet the artist reception will take place on Saturday, April 6th from 2-4 p.m. with light refreshments. Christine Corrow is a native to Massachusetts who has painted in several different mediums in her more than 30-year art career. She launched her career early in life as a young mother by using her natural talent in the medium of tole painting on slate and wood. Over the years she has transformed her artistic vision into abstracted views of the world around her. Though mostly self-taught, she is currently pursuing her life-long dream of a Bachelors Degree in Fine Arts at Worcester State University. Christine is passionate about her art and wishes to share the power of art as a healing tool with others. She is currently teaching at several area senior centers and has several upcoming art shows at local businesses. When Christine is not painting she enjoys spending time with her children, grandchildren, friends, and family. Christine is a devout Christian who looks to God to help her create her beautiful artwork. 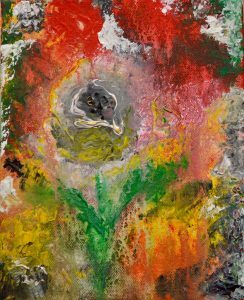 For Christine painting is a spiritual experience and its healing powers are significant to her vision for sharing her artwork with others.